Lucy McRae is a body architect. Trained in classical ballet with a background in architecture and fashion, she explores how the human body can be transformed with the use of technology. Her work at the Philips Far Future Design Lab, a lab that looks 20 years in the future, includes such projects as emotional sensing clothing and electronic tattoos. 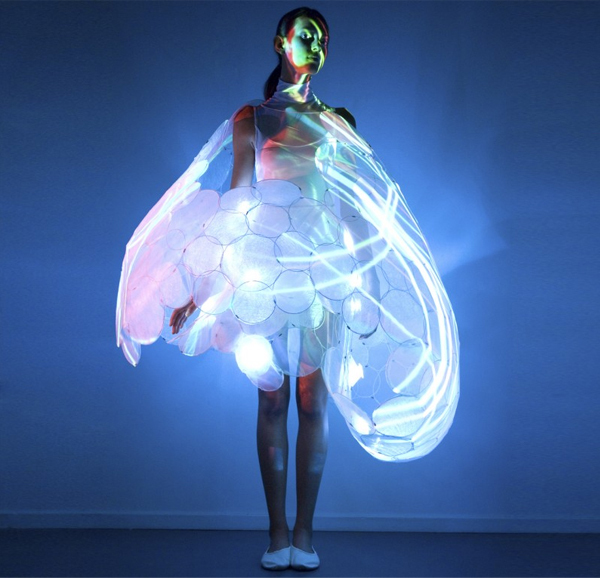 The Philips Skin Probe Dress uses emotional sensing technology to create dynamic fashion. The dresses will blush and shimmer with light based on the person’s emotions. Another Philips Design Probe explores the body as a platform for electronics and interactive skin technology. Here is an electronic tattoo which changes when touch. Another project Lucy McRae worked on was reprogramming body odor. Through the use of a digestive perfume – a fragrance comes out of the skin when you perspire.